Weighty Matters: Did You See the One About Low-Carb Diets Being No Better than Others? Did You See the One About Low-Carb Diets Being No Better than Others? There is a study that has been making the rounds the past few days. It touts itself as a meta-analysis designed to answer the question of whether or not low-carb diets are better for weight loss, and also whether low-carb diets are safe. I'll cut to the chase. The study concludes low-carb diets are no better for weight loss and yes they're safe.....but, the authors bizarrely used a carb cutoff of 45% to define "low". A diet with 45% of calories coming from carbs is not a low-carb diet and certainly isn't usefully comparable to one containing 20% carbs (and yet the authors did). So sadly this paper doesn't help with the questions it set out to answer, but for what it's worth, my non-objectively quantifiable take on low-carb diets is that if they help you to control your intake, and you enjoy living that way, I wouldn't waste a moment worrying about safety. 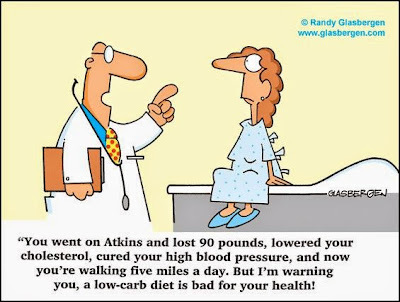 Of course if you don't enjoy low-carb life, please don't think there's no other way to go. Reading this piece I could help but wonder, where, oh where, is peer review?